This party wanted ALL the watertoys. Some vessels come with them, others you can upgrade to add them on to your package. Are you ready for your charter? 👏🏻. Snorkeling in Cancun is unlike any other. Whether you’re a beginner, novice or extremely experienced.. there is plenty of stunning snorkeling spots for you 🐠. Tropical days are the best days 🏄🏻‍♂️. Looking for a luxurious getaway? Our 100 AZIMUT CAPRICHO LUXURY YACHT is just right for you 🛥⚓️. A private charter in Cancun is always a good idea 💁🏻‍♀️. All ready to go 🛥. Did you know some of our charters come with a jet ski add on, others you can request one or even two. It’s just a way to make an amazing charter even better. Catering and Water Toys are important options to offer in every charter that we host. Please take a look here, and see what’s available to you. See sample itineraries for day charters and longer term charters or build your own itinerary with personally selected yachts, food, beverages, locations and water toys. The Caribbean is rightly referred to as a yachting paradise. There is no better way to experience an unsurpassed taste of freedom, elegance and style than on a luxury yacht, and perhaps no other destination in the world that can offer the wide range of beaches, gorgeous islands, fishing, diving / snorkeling, clear water, and supreme sailing conditions than the islands of the Caribbean. All of these ingredients make for the perfect excursion to key destinations such as Belize and the Cayman Islands … or even Cuba. 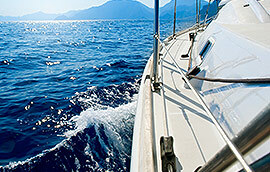 Yachts can be chartered for a weekend or even a week depending on your itinerary and pace. Cancun Yacht Charters takes pride in making your yacht rental experience in Cancun personal and unforgettable. Our yachts vary immensely in size, style and function. Our inventory consist of scuba yachts, fishing yachts, luxury yachts, catamarans, and sailing yachts available for charter ranging from 40’ to over 100’ and we strive to make every crewed cancun yacht event uniquely different, covering all the details of your boating experience. Yachting with us means 5-Star Service, bi-lingual valet, catered food and your choice of beverages, customized itineraries and a healthy combination of travel options. Our certified and licensed Captains look forward to delivering you to your destination while a crew caters to your every need during your personal luxury yacht charter. We take satisfaction in exceeding every clients’ expectations and look forward to helping you plan your dream getaway with us. Our boats are the perfect venue for wedding proposals, weddings, anniversaries, honeymoons, birthdays, quinceaneras, corporate events, retirement parties, graduations, reunions, fundraisers, memorials, and ash scatterings. For Spring Breakers, Bachelor / Bachelorette parties, or just coming to have fun. All events come catered with onboard prepared exquisite cuisine from one of our chefs, and all of your favorite drinks and - of course - the best music all hosted by your bi-lingual valet. Crewed yacht charters typically cost no more than a cruise on a ship or an exclusive hotel, however, unlike a cruise or hotel stay you have the ultimate privacy with control and freedom. You and your guest will be the only company aboard the luxury yacht and the only ones the crew will be paying attention to. Make your next daytime or evening event unforgettable by dining with or entertaining your guests while cruising Cancun, Isla Mujeres, Tulum, or just anchoring down in the water and having pure, exhilarating fun! Just call and you will see why we are the top yacht rental company in Cancun, Mexico.